or hoods for check-in at 10:00 am. Come join the UW School of Public Health as we celebrate the achievements of our graduating Class of 2019! We will honor undergraduate and graduate students receiving degrees at the School-wide ceremony, followed by a reception with light refreshments. When and where are this year's events? The 2019 SPH Graduation Celebration ceremony will take place at the Hec Edmundson Pavilion (Alaska Airlines Arena) on June 16, 2019, with a School-wide reception immediately following in the Concourse. Walk NE along Stevens Way, turn right on Snohomish Lane and go over the overpass. Metro routes 43, 44, 48, 65, 75 and 271 will provide service to or near Husky Stadium via their regular routes. There may be schedule delays due to traffic. 2. Take Hwy 520 exit toward Bellevue-Kirkland. 3. Travel 1/4 mile and take the Montlake Boulevard exit. 4. At the end of the off ramp there is a stop light at Montlake Boulevard. Turn left. 5. Travel across the Montlake bridge. You will see Hec Ed Pavilion on the right. 6. To access the E-10 or E-11 parking lots, turn right into the main stadium lot. 7. To access the C-21 parking lot (underground garage), turn left onto Pacific and make your first right. The garage is on your left. 8. To access the N-24 parking lot, continue on Montlake past Hec Ed. Go 1/2 mile to the visitor's entrance on your left. Follow the directional sign. 1. From Hwy 405 take the Freeway 520 exit toward Seattle. This leads you onto the Evergreen Point Floating Bridge heading West. 2. Once across the bridge, take the Montlake Boulevard Exit. Turn Right. 3. Travel across the Montlake bridge. You will see Hec Ed Pavilion on the right. 4. To access the E-10 or E-11 parking lots, turn right into the main stadium lot. 5. To access the C-21 parking lot (underground garage), turn left onto Pacific and make your first right. The garage is on your left. 6. To access the N-24 parking lot, continue on Montlake past Hec Ed. Go 1/2 mile to the visitor's entrance on your left. Follow the directional sign. Students will need to pre-purchase parking permits ($14.00) from Office of Ceremonies for guests wishing to park on campus. Day-of-event parking permits will be $15. Who is invited? Do I need tickets? All students, faculty, staff, family and friends of the graduates are encouraged to join us. Am I required to RSVP? Yes! All students and faculty attending the SPH Graduation Celebration must RSVP here. Am I supposed to wear a cap and gown? Who will be recognized as a graduate at the events? These events will honor all graduates and soon-to-be graduates (those who graduate Autumn 2018 through Summer 2019), from bachelor to doctoral degrees. Is this the official University of Washington Commencement Ceremony? No. UW Commencement is on Saturday, June 15th. Please view the UW Commencement website for more information. Yes! At 1:30PM following the ceremony, cake and coffee will be provided at the reception. If you find that you're hungry before the reception, food will be available for purchase before and during the ceremony at the concessions stand closest to the main entrance on the SW side of the arena. All forms of payment are accepted. Food available for purchase will include: hot dogs, popcorn, pretzels, nachos, assorted candy, coffee, Coke products, and bottled water. Yes! Hec Edmundson Pavilion and Concourse are wheelchair accessible and we will have a seating area for those needing special assistance or accommodations. Please contact Student and Academic Services at sphsas@uw.edu for further information. We are happy to help! 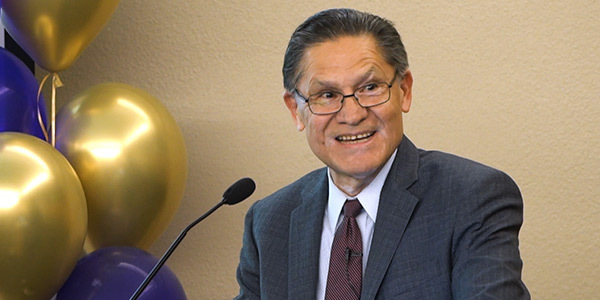 Distinguished alumnus Rogelio Riojas (MHA, 1977) has been chosen as speaker for this year's SPH graduation celebration.